Singapore’s cocktail scene has built for itself a stellar reputation in recent years, and no wonder – the space is literally brimming with talent and innovation. We’re talking about placing a full 13 bars on Asia’s 50 Best Bars in 2017, of which six even landed on the coveted World’s 50 Best Bars list in the same year. Yet despite the wins the industry isn’t resting on its laurels, and that’s a good thing. 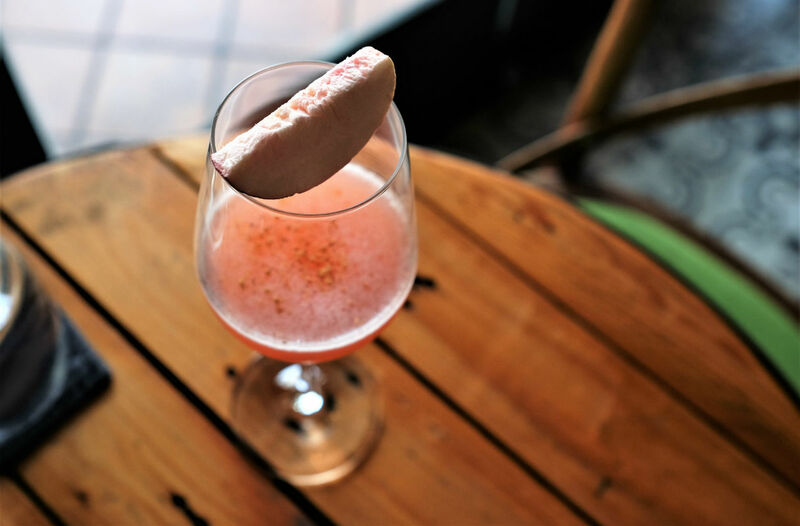 Besides reinventing concepts or developing new ones – Jigger & Pony Group, for example, will be launching a new Italian bar restaurant called Caffe Fernet in the next few weeks – the more progressive bars are always reinventing their offerings to continually excite cocktail hounds in this gastronomically fickle city. We take a look at four cocktail bars that have recently rejigged their cocktail menus. Tippling Club taps into your innermost dreams and desires. Award-winning progressive cocktail bar and restaurant Tippling Club is known for many things, but right at the forefront is its chef-owner Ryan Clift’s rabid willingness to experiment with different culinary techniques to create some of the most innovative dining and drinking experiences around. In late 2016 Clift worked closely with head bartender Joe Schofield to create a “Sensorium” cocktail menu – in collaboration with New York-based fragrance makers International Flavors & Fragrances – that came in the form of fragrance strips, where you decided on a drink based on the fragrance one liked best. Clift continues that collaboration with IFF to create a new installment of the Sensorium menu, but this time as a menu called “Dreams and Desires” consisting of edible gummy bears. That’s right, you order a cocktail based on the taste of the gummy bear you like. Dreams and Desires consists of 12 different cocktails; there’s the likes of Happiness ($24++), a citrusy tequila-based concoction spiked with honey that’s the taste of sunshine, or perhaps you may like some Lust ($24++), a seductive creation with flavours of peach, tonka bean, vanilla and topped with Champagne, and comes complete with an edible garnish. See what our friends over at Highest Spirits think about Tippling Club’s Dreams & Desires cocktail menu. For those who prefer something more powerful, there’s the white wine- and gin-based Super Car ($24++) with the giveaway petroleum-esque whiff of earthy truffle oil, along with a tinge of citrus and butter. Alternatively go for Success ($24++), a potent mixture of red wine, Amaro, Cognac, and whisky, because, after all, who doesn’t like the taste of success? The fun part about Dreams and Desires is choosing a cocktail based on how you imagine it might taste – you’re not encumbered about what spirit base that cocktail employs or how it’s put together. It’s about being vulnerable; not unlike when you’re sharing your dreams and desires with someone you care about. Tippling Club is located at 38 Tanjong Pagar Road, Singapore 088461. Open 12pm to 12am Mondays to Saturdays, closed on Sundays. Smoke & Mirrors teases your eye even as it surprises your palate. Rooftop bar Smoke & Mirrors has seen just one major menu revamp since opening up in 2015. 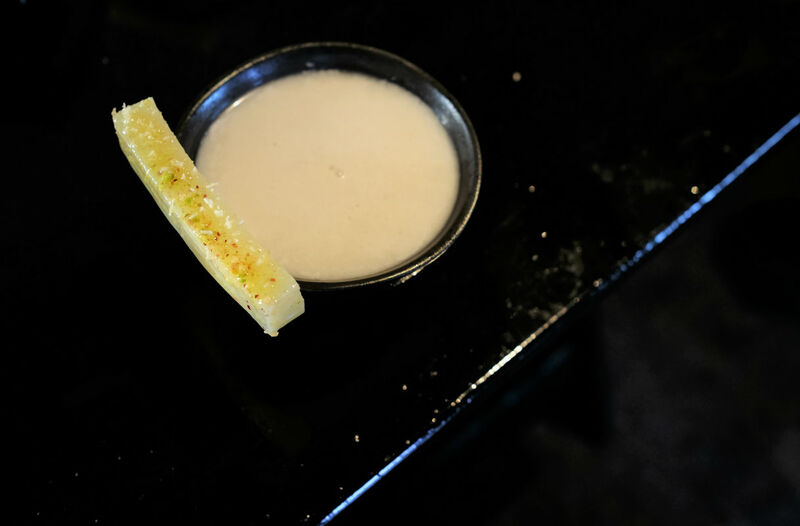 At that time head bartender Yugnes Susela’s cutting-edge cocktails surprised tastebuds across the board with the clever use of infusions – such as a range of tea-infused spirits – but mostly for his shocking use of duck fat in his signature Duck’s Fat Hope. But his cocktail-making repertoire has grown from leaps to bounds since; his love for modern gastronomic techniques – something he’s cultivated from young and accelerated during his time at Tippling Club – is most evident in his latest progressive menu, The Playful Eye. In fact, he’s so inspired by the culinary world – Susela counts Mugaritz as one of his major influences – one could even say that you’d eat his new cocktails as much as you drink them. In fact the new signature, self-named Smoke & Mirrors ($24++) is a direct tribute to the award-winning Spanish restaurant. The tequila-based cocktail is powerful and punchy, and nicely rounded off with spice and herb notes. But the garnish comes in the form of edible soil made from pistachios and cocoa powder, along with ‘truffles’ made from cardomom-scented apple. 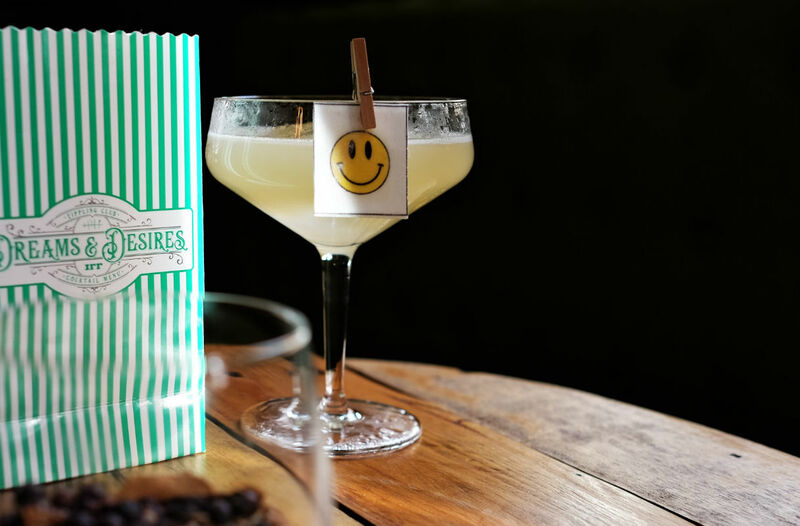 Our friends from Parched share their thoughts on the Playful Eye menu from Smoke & Mirrors. Then there’s the likes of the Kurokawa ($22++), made with vodka that’s been infused with kombu seaweed, goma-shio (a black sesame based tincture) and garnished with Okinawan umibudo sea grapes; it’s literally a taste of Japan in a cup, bursting with a multitude of savoury, sweet, sour, bitter and umami flavours. But if you miss Susela’s iconic Duck’s Fat Hope – which is no longer on the menu – we’re happy to report that it’s seen an upgrade; the Mighty Duck ($20++) is everything the Duck’s Fat Hope was and hoped to be. Like its predecessor it’s made with jackfruit-infused rum and spiced honey, but now it comes served in a nest with edible eggshells. 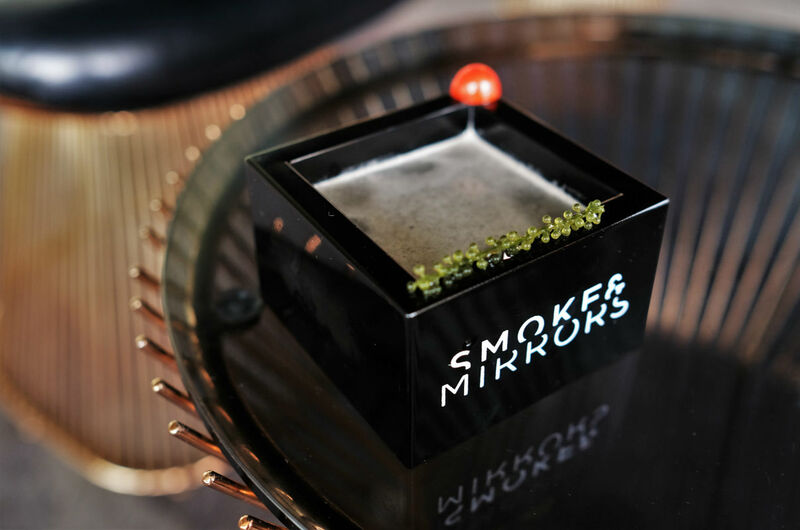 If a cocktail bar can ever win a culinary award, we reckon Smoke & Mirrors – with its The Playful Eye menu – will be in the running. Smoke & Mirrors is located at 1 St. Andrew’s Road, #06-01 National Gallery Singapore, Singapore178957. Open 3pm to 1am Mondays to Thursdays, 3pm to 2am on Fridays, 12pm to 2am on Saturdays, and 12pm to 1am on Sundays. Nutmeg & Clove digs deep into Southeast Asia’s natural history. We have a soft spot for avant-garde Singaporean cocktail bar Nutmeg & Clove – its convivial, unpretentious vibe is a perfect backdrop for a slew of delicious cocktails inspired by familiar local and Southeast Asian flavours. 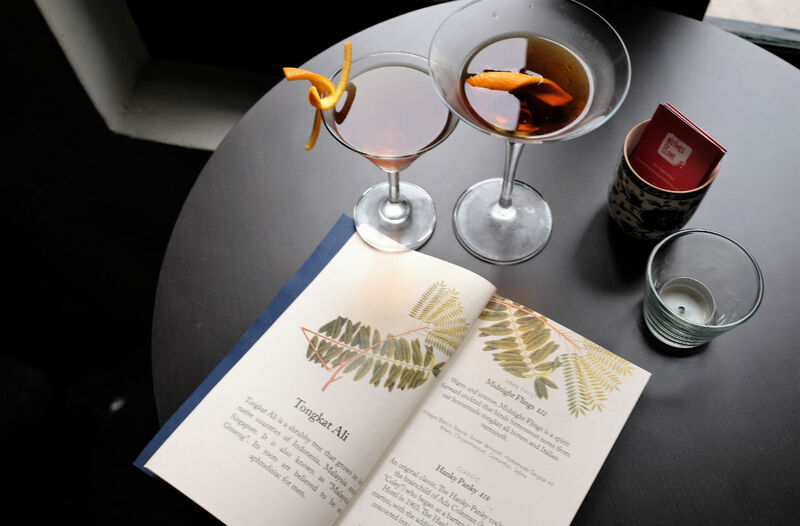 Not many other bars in town have the kind of intimate knowledge of local ingredients they do – nor the chutzpah to use them either – but Nutmeg & Clove does it with pluck and aplomb; just look at their irreverent festive cocktails for Chinese New Year. Its previous menu told the story of Singapore. This time round, Nutmeg & Clove owner Colin Chia actually collaborated with Singapore’s National Heritage Board and tapped the William Farquhar Collection of Natural History Drawings for inspiration. William Farquhar was Commandant of Malacca and later of Singapore in the early 1800s, and during his time in the Far East he commissioned artists to capture the region’s biodiversity including fruits, flowers and spices in the form of illustrations. Nutmeg & Clove’s latest cocktail menu showcases the flora indigenous to this part of the world, incorporating them into classic drinks to give them a unique, local twist. 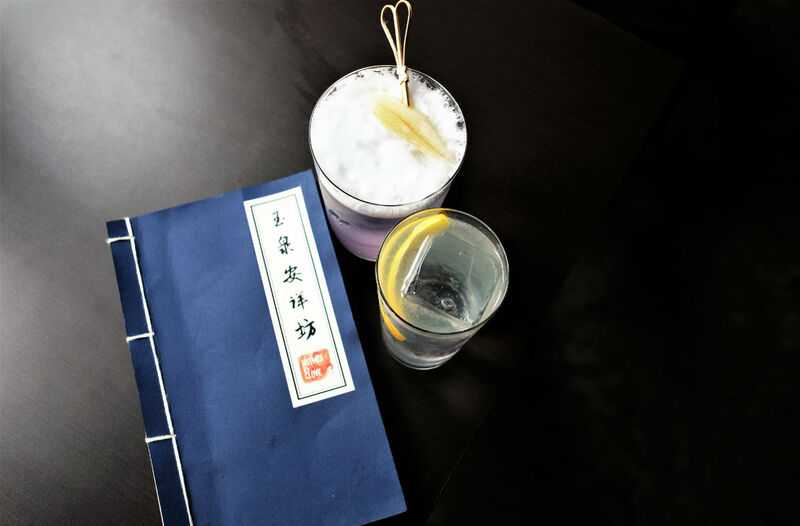 In fact the menu comprises of both the classic cocktails and their reimagined versions. There’s that Ada Coleman favourite of Hanky Panky ($18++), the sultry concoction of vermouth, gin and Fernet Branca, that you can try with the modern Asian counterpart of the Midnight Flings ($22++). The local touch? The use of tongkat ali, the root of a native herb considered to be a local aphrodisiac. The gin is also replaced with mezcal for a smokier touch. For fans of the whisky sour – as we are – Nutmeg & Clove offers the New York Sour ($18++), a version that’s spiked with a little red wine. Then there’s the one that William Farquhar (indirectly) had a say in: the Straits Time Sour ($22++), spiked with cloves that’s been infused into the gin used in its creation, as well as basil syrup. For the adventurous though, the King and Queen ($22++) is the ultimate test in a bartender’s skill and provides a unique complexity of flavours. Named after the king and queen of fruits – the durian and the mangosteen – this cocktail is surprisingly balanced and not as pungent as you may expect from a drink that’s made with notoriously stinky durian. It’s a heavily tweaked version of the classic Milk Punch ($18++), so if the idea of durian turns you have there’s something more familiar to turn to. If you’re looking for a taste of Singapore in a cocktail, Nutmeg & Clove is your go-to. Nutmeg & Clove is located at Level 2, 10 Ann Siang Hill, Singapore 069789. Open 6pm to 1am Mondays to Thursdays and Saturdays, 6pm to 2am on Fridays, closed on Sundays. Elixir Bar for where myths and legends come true. 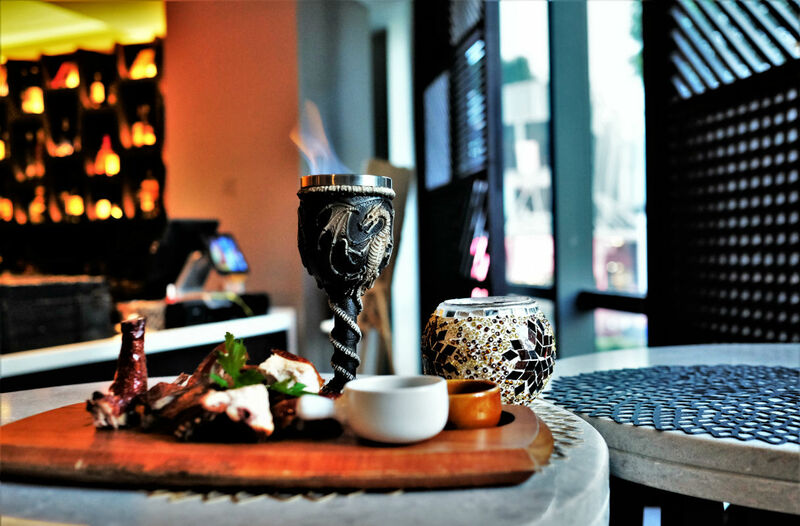 We’ll be totally honest and say that Elixir Bar – the resident bar in modern Chinese restaurant KUVO – has never really registered on our drinking radar, mostly because there are so many other worthy bars to visit located along the Orchard Road tourist stretch. But when mercurial head bartender Yutaka Nakashima departed late last year it opened the door to renewal, and KUVO bet on 24-year old Ukrainian Vladyslav Buzko to take over the reins and rework the cocktail menu at Elixir Bar. Despite his tender age young Buzko already possesses a multitude of experience, having participated in multiple bartending competitions and ranking in the finals for most of them. 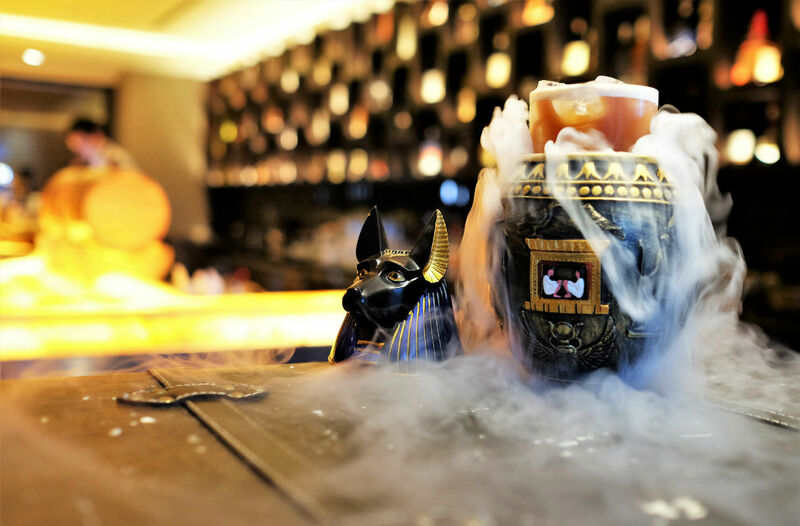 For Elixir Bar, he digs deep into Egyptian, Roman and Greek mythology for a cocktail menu is delicious as it is visually stunning. Each cocktail is literally a feast for the eyes, with most of them coming in ornate, decorative drinkware that belong more on a set of Game of Thrones than any Orchard Road bar. The Anubis Potion ($26++), named after the Egyptian God of the dead, comprises of Monkey Shoulder whisky, Galliano ristretto, syrup, chocolate bitters, jackal blood and the ashes of God. Wait, what? Yes, Buzko cheekily creates his own infusions and assorted ingredients that he names after exotic reagents you’d expect a witch to toss into a cauldron. The list goes on. There’s the very punchy and strong Jupiter ($26++) – appropriate for that most celebrated of Gods from the Roman pantheon – made with Cognac and Benedictine DOM along with “meteorite” and “perpetual glue” as component ingredients. Or how about the “heart of swan”, “slime of snail”, “drooling of ant” and “roses of oblivion” in Aphrodite’s Secret ($23++), which also just happens to contain gin? Some may find such a theme to be too gimmicky for their liking, but the truth is that the cocktails are actually really well conceptualised and executed. In time, Buzko may just build a legend for himself. Elixir Bar is located at 321 Orchard Rd, #02-01 Orchard Shopping Centre, Singapore 238866. Open 5pm to 1am from Mondays to Thursdays, 5pm to 2am on Fridays, 12pm to 2am on Saturdays, and 12pm to 1am on Sundays.